Westboro Photonics offers additional integrated spectroradiometers on all colorimeter platforms. Featuring thermoelectrically-cooled sensors up to 12 megapixels, these instruments are built to handle the high accuracy and reliability demands of R&D and production environments. The WP6 Series features 16-bit A/D conversion and temperature regulation to 0.1° C, enabling precise and accurate measurement of even the finest details. Pixel level measurements of flat panel displays, backlit keyboards, or automotive panel graphics can be quickly and reliably measured. Because imaging colorimeters are often compared to and corrected by spot spectroradiometers, it makes sense to integrate the two. 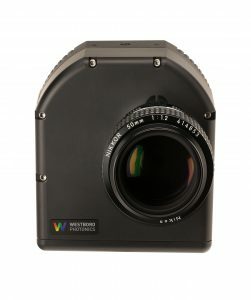 With the WP6ES, a circular area in the center of the measurement can be measured with both the imaging colorimeter and the „spot“ spectroradiometer. Photometrica software automatically computes a color correction based on a comparison between the two measurements. This correction can significantly improve the accuracy of the imaging colorimeter. The new WP6E and WP6ES Series feature electronic focus and iris control, resulting in improved accuracy and enhanced automation.